"We combine satellite data with ocean measurements to depths of 1,800 m, and show that between January 2001 and December 2010, Earth has been steadily accumulating energy at a rate of 0.50 ± 0.43 Wm−2 (uncertainties at the 90% confidence level). We conclude that energy storage is continuing to increase in the sub-surface ocean." However, the small "steadily accumulating energy" of only 0.50 W/m2 is far less than even the most conservative estimates from the IPCC AR5 of total anthropogenic radiative forcing. According to the IPCC's "high confidence" estimates, total anthropogenic radiative forcing in 2011 relative to 1750 was 2.29 W/m2 [range 1.13-3.33, at "90% certainty"]. Thus, the ocean data demonstrates Earth is accumulating heat at 4.6 times [2.29/0.5] less than the IPCC central estimate, and 2.3 times less than the IPCC lower-bound estimate. Thus, the alleged energy accumulation of "0.50 ± 0.43 Wm−2 (uncertainties at the 90% confidence level)" is not even within the IPCC bounded estimates for energy accumulation, therefore, most of the "missing heat" remains AWOL, or most likely, never existed. Further, the fact that Earth has accumulated energy does not imply it must be from anthropogenic sources. Solar amplification mechanisms, including driving of ocean oscillations, cannot be conveniently ruled out as the source or a contributing source. 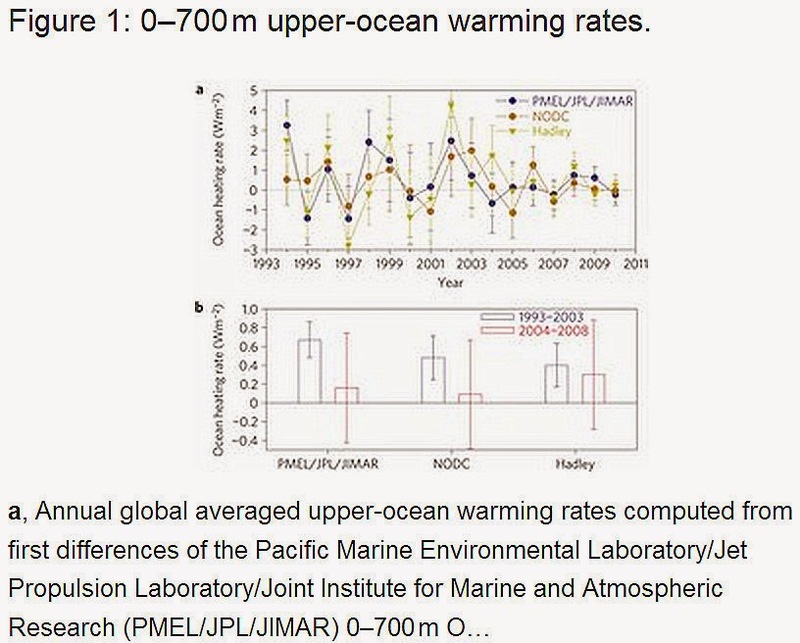 In addition, the figures below from the paper show the warming rates of the oceans have generally declined since 1993 and since 2001, opposite of the warmist's claims that more of the "missing heat" has recently decided to hide in the oceans, one of over 50 'excuses' for the 18+ year "pause" of global warming. 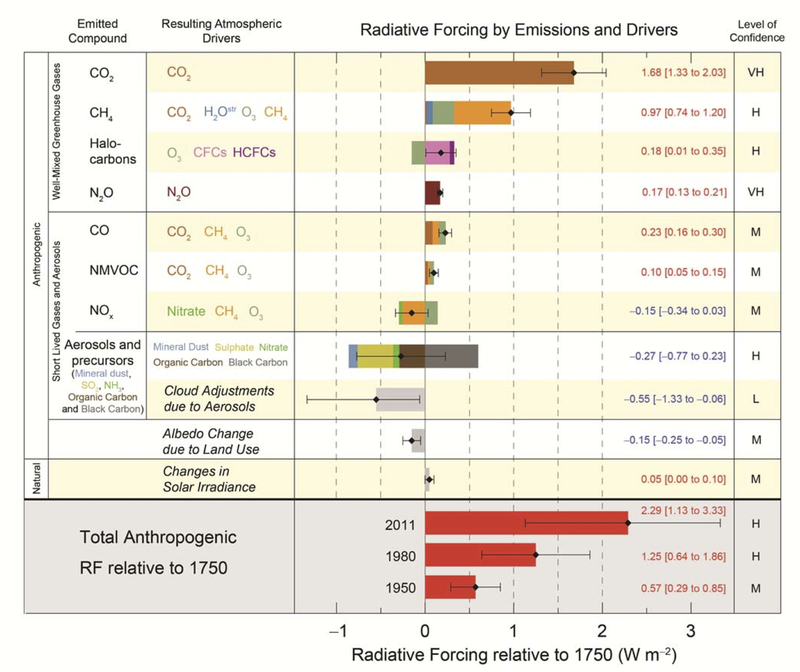 From IPCC latest AR5 report, chart of radiative forcings relative to 1750. Global climate change results from a small yet persistent imbalance between the amount of sunlight absorbed by Earth and the thermal radiation emitted back to space1. 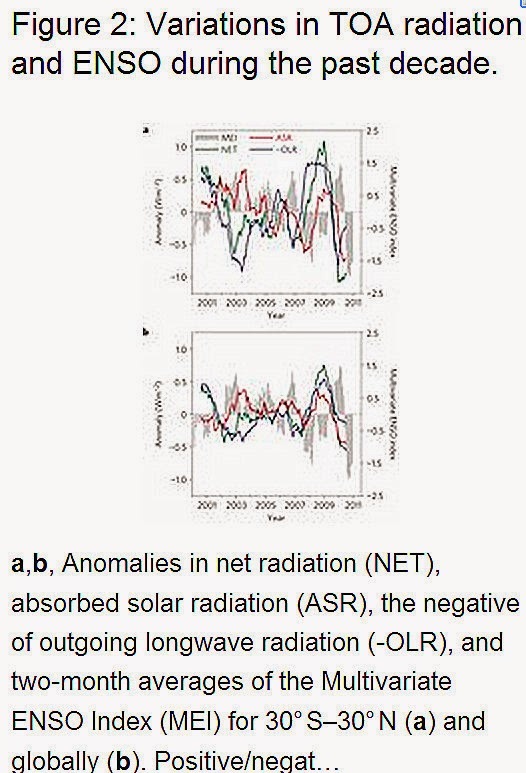 An apparent inconsistency has been diagnosed between interannual variations in the net radiation imbalance inferred from satellite measurements and upper-ocean heating rate from in situ measurements, and this inconsistency has been interpreted as ‘missing energy’ in the system2. Here we present a revised analysis of net radiation at the top of the atmosphere from satellite data, and we estimate ocean heat content, based on three independent sources. 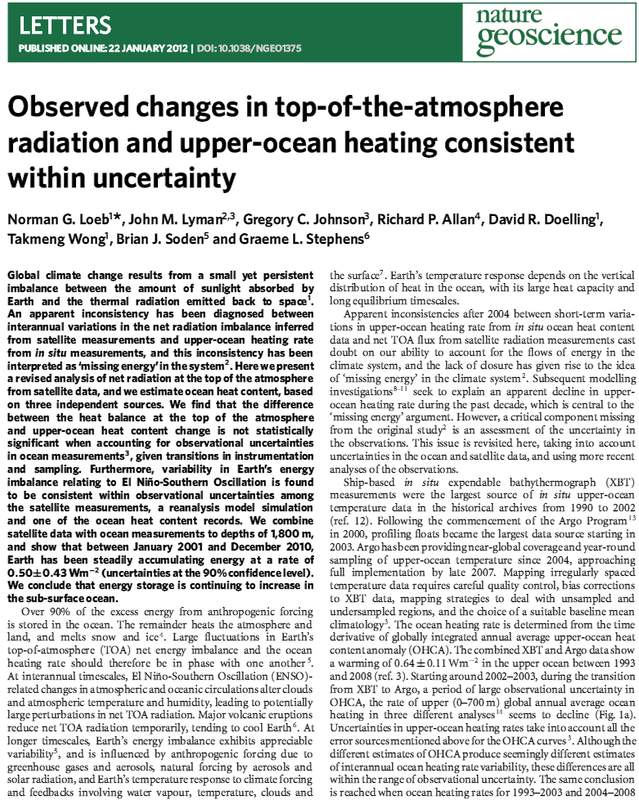 We find that the difference between the heat balance at the top of the atmosphere and upper-ocean heat content change is not statistically significant when accounting for observational uncertainties in ocean measurements3, given transitions in instrumentation and sampling. Furthermore, variability in Earth’s energy imbalance relating to El Niño-Southern Oscillation is found to be consistent within observational uncertainties among the satellite measurements, a reanalysis model simulation and one of the ocean heat content records. We combine satellite data with ocean measurements to depths of 1,800 m, and show that between January 2001 and December 2010, Earth has been steadily accumulating energy at a rate of 0.50±0.43 Wm−2 (uncertainties at the 90% confidence level). We conclude that energy storage is continuing to increase in the sub-surface ocean. The only reason people ever use 90% error bars is that the 95% looks too large. I would be willing to bet a 6-pack of beer that the 95% error would be larger than the presumed effect of 0.5 and that is why they used 90%. 0.43 is bad enough as an error. So, you can't really say if there is an effect or not. The instrumental errors and errors in estimating other parameters introduce relatively large uncertainties as discussed by Loeb et al in their 2009 paper. Toward Optimal Closure of the Earth’s Top-of-Atmosphere Radiation Budget. The uncertainty is further demonstrated by a team led by Stephens, the last author in Loeb et al (2012) who show that the combined uncertainty in the net radiative imbalance is about 28 times as great as the estimate itself (17 / 0,6 =). "The net energy balance is the sum of individual fluxes. The current uncertainty in this net surface energy balance is large, and amounts to approximately 17 Wm–2. This uncertainty is an order of magnitude larger than the changes to the net surface fluxes associated with increasing greenhouse gases in the atmosphere (Fig. 2b). The uncertainty is also approximately an order of magnitude larger than the current estimates of the net surface energy imbalance of 0.6 ±0.4 Wm–2 inferred from the rise in OHC. 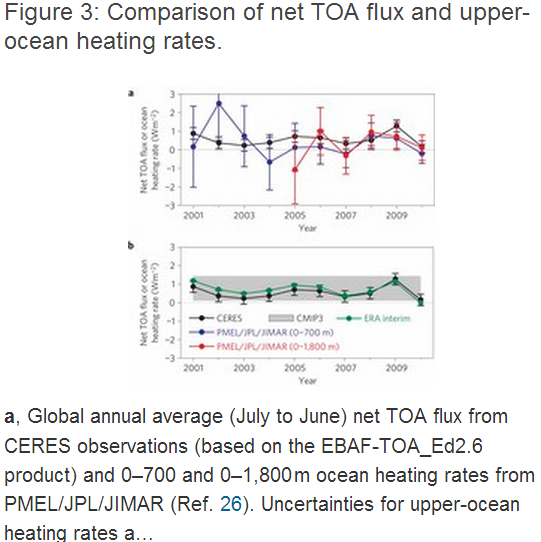 The uncertainty in the TOA net energy fluxes, although smaller, is also much larger than the imbalance inferred from OHC." A paper by Yeo et al (2014) has a Figure 5 that shows TSI between 2003 and 2009 declined by 1.6 Wm-2. The global average decline would be 0.4 Wm-2 (1.6 divided by 4). Download free by registering for free. Hansen et al. (2011) Earth’s energy imbalance and implications, Atmos. Chem. Phys., 11, 13421-13449, 2011). Thanks Frank. I'll check it out. Error bars the same size as the effect are bad enough but error bars 10X the effect - ridiculous to make predictions based on them. Just saw Peilke Srs' comment on Levitus et al (2012). Levitus et al. estimate historical energy imbalance at the Earth's surface to have been significantly less than Hansen, Loeb, and Stephens. There is a comprehensive review paper Observing and Modeling Earth’s Energy Flows by Bjorn Stevens, Stephen E. Schwartz, Surveys in Geophysics, 2012, Volume 33, Issue 3-4. My main point is that the uncertainties are either greater than the estimated imbalance or a significant percentage ot the imbalance. As Bjorn Stevens, Stephen E. Schwartz show, variations in cloud cover is a big factor in uncertainty.